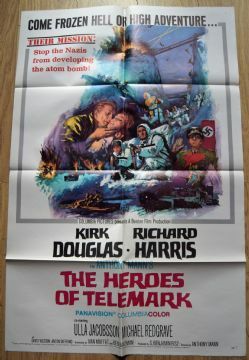 Heroes of Telemark (Benton Films,1965) One Sheet 27"x41"
Historical Action Drama starring Kirk Douglas, Richard Harris, Ulla Jacobsson and Michael Redgrave. This rare one sheet poster has a fold separation on the top fold which measures approximately 1". Very Good.